The process of selecting MLB hitters can seem like one of the hardest challenges in daily fantasy sports. After all, a player only has four at-bats to rack up fantasy points. If he makes good contact, but hits the ball directly at a defender every time, you are looking at a big fat goose egg. While a “0" won't necessarily kill your MLB lineups like it would in NBA, it can be frustrating, especially when paying a premium on some of the top-dollar stars. 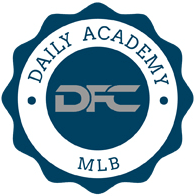 This article aims to lay the basic foundation of how to select hitters in daily fantasy baseball. there is no such thing as a “must play hitter" in MLB DFS. Due to the volatile nature of the sport, even the best hitter against the worst pitcher isn't a lock to score any fantasy points. This is quite the contrast from NBA and NFL, where you certain guys are necessities in great situations and matchups. Due to this, price sensitivity is key. The object is to find as many quality hitters in “plus situations" (more on how to find these guys later) to stack your lineup top to bottom. Using this philosophy, it makes sense to use a more balanced approach instead of overpaying for a high end commodity. Of course, you'll need to feel out certain game slates, but be sure to factor in salary as a key component. This may seem counterintuitive to someone beginning their MLB DFS journey. However, you'll be quick to realize that the crux of this fantasy game revolves around pitching. You should start your research by identifying the most susceptible pitchers. These are the guys you will want to attack by lining up capable (well-priced) hitters against them. Look closely at the Vegas odds. This is the easiest way to identify which team will score the most runs. The teams with the highest run totals are the best ones to target. How well does a pitcher throw vs Right-Handers, Lefties? Use splits of wOBA vs LHB & RHB over the past three years to get a sense of the pitcher's quality. We will get more in-depth with this in the “advanced section", but remember the platoon advantage as a general rule – Righties hit lefties better and lefties hit righties better, which holds true for majority of the MLB. Park Factor. This is often built into the spread, but some ballparks cater more towards hitting or pitching. If you pay attention to the Vegas odds, you will see these parks usually have a higher total than other games. You'll generally want to target the 1-5 hitters on each team for several reasons. First off, the best players from each team usually sit in the top half of the lineup. Secondly, these guys obviously have a better chance at seeing more at bats, especially the 1-3 hitters. Next, you'll need to consider the quality of hitters surrounding the prospective pick. Is he surrounded by decent players that can drive him in? Are there hitters in front of him with a good chance of getting on base? Think about it … going 2-4 with two singles is a decent game, but it turns into a great fantasy outing if you can add 2 RBI's or a couple of runs to that total. We briefly touched on this point in the "It all starts with pitching" section, but now we will elaborate on some metrics to use when screening for hitters. wOBA – This stands for Weighted On-Base Average used as an encompassing statistic to measure a hitter's value. In a nutshell, wOBA accounts for extra-base hits, weighing them appropriately to give a superseding number. Batting average and on-base percentage don't account for doubles, triples, and homeruns, which is why wOBA is a more preferred predictive indicator. wRC+ -- This stands for Weighted Runs Created Plus, and it is derived from the aforementioned wOBA metric. Essentially, it measures how many runs a player is worth, then adjusts for context such as league and park factor to make comparison from player to player much easier. Sample Size – When looking at these stats, you must take into account sample size. The stabilization point for wOBA and wRC+ is somewhere over 400-450 plate appearances. Keep that in mind, as a sample size less than that number will have less predictive power. Splits – You can break down these stats even further by examining each players hitting metric vs left-handed or right-handed pitching. It pays to be aware of the wider splits, targeting the player in a more favorable situation. This is more of a subpoint than the previous three, but it's important nonetheless. On FanDuel, every out counts as negative 0.25 pts, so it makes sense to target more “contact hitters" when assembling lineups. However, on DraftKings, there is no penalty for outs. This makes it easier to gamble on power hitters with homerun upside but lower averages/contact rates.